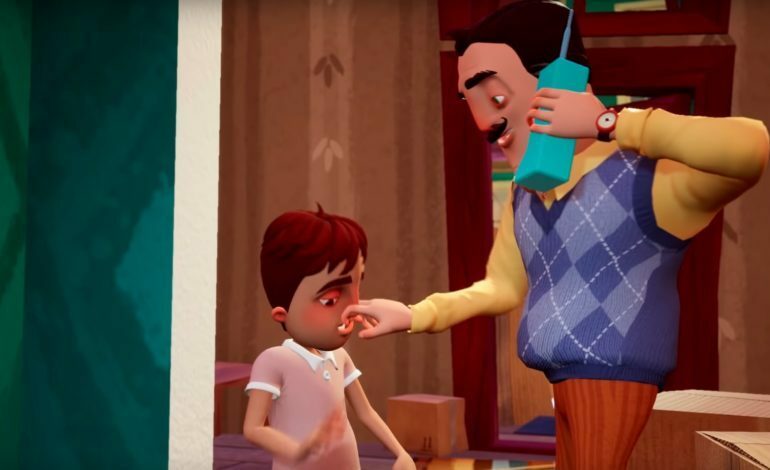 Publisher Tinybuild has announced that its recent stealth-horror game, Hello Neighbor, will be getting a prequel. It’s called Hello Neighbor: Hide & Seek, and it will be the story behind your nemesis in the original Hello Neighbor. Hello Neighbor released less than a year ago, back in December of 2017. The original game was the surreal story of a boy attempting to infiltrate his mysterious neighbor’s home and uncover secrets the neighbor is suspected of harboring. In Hide & Seek, the roots of those secrets may be revealed, and it looks like the in-game environments have expanded a bit since the first game. Whereas before players had to sneak through increasingly complicated versions of the neighbor’s house, the new trailer offers hints of outdoor areas and cityscapes – including what looked like a city on fire. The trailer also showed us the deteriorating relationship between the neighbor, his two children, and hints towards something unfortunate happening to his wife. The two children, at least, appear to be in a downward spiral, both towards their father and between each other. The brother holding a gun definitely didn’t look reassuring. Given the focus on story in the trailer, gameplay may lean towards that and involve a bit more than stealth and horror. Hello Neighbor: Hide & Seek is currently set to release sometime this December. Beyond that, an exact release date has yet to be revealed. However, a free Alpha demo version of Hide & Seek is available for download right now from the Hello Neighbor website.